We all know that a solid, healthy roof is important to the integrity of a building. But how do you keep a roof healthy? We’re going to answer those three questions for you, so grab a cup of coffee or a glass of sweet tea, put your feet up, and give us a listen. Getting up on a roof is not on the top-ten list of things most home- or business-owners like to do. We’ve heard too many stories of the guy that topples off the ladder while fixing something on the roof and ends up in the rose bushes . . . or the hospital. Nope, none of us wants that. So roofs tend to get neglected. Your roof is the most important part of your home or business when it comes to providing shelter and protection from the weather. It’s also the platform that supports equipment and features such as solar panels, vent pipes, skylights, antennas, gutters, and satellite dishes. It needs to stay strong and whole. What happens to a roof over time? That depends on what the roofing material is made of and if the decking or supports have been subject to leaks, moisture, and rot. Residential roofs are typically made of asphalt shingle, clay tile, cedar shakes, slate, or metal. Of these materials, tile, slate, and metal are the most durable and can last for decades. Asphalt shingle roofs are less expensive but have a shorter lifespan than the hard roofing materials. They are composed of layers of aggregate (the pebbly stuff) with a limestone filler. Over time, rain, hail, and even wind break down the aggregate and it gets worn off. When a lot of the aggregate wears off, it leaves bare areas of the shingle surface, and the roof loses its effectiveness in protecting the home. Tile and slate roofs are not as susceptible to rain, hail, and wind, but they can suffer breakage from other forces—people walking on them incorrectly, branches falling on them, or getting hit by golf balls or other objects. Breaks and cracks in the slate and tile allow moisture and heat to get through to the roof material underneath. Usually this is a very durable layer, however, it’s still good to have cracks or breaks in clay and slate tiles repaired. Roofs also get moldy, especially in areas where heat and humidity are high. No roof is impervious to mold. Keeping a roof clean keeps it healthy. 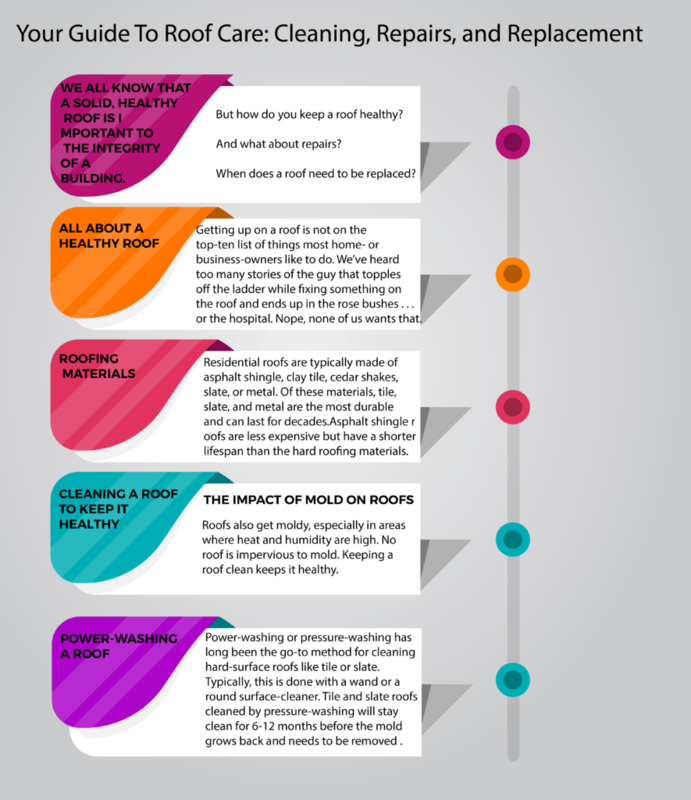 Mold on roofs impacts their appearance. Cleaning a roof makes a home and building look cared for and well maintained. This adds to curb appeal and elevates asking price for properties that are on the market. Mold damages tile roofs. It sends down micro-roots into cracks and fissures, widening them and compromising the integrity of the tiles. Mold on asphalt shingles absorbs heat, which makes the roof hotter and heats up the attic space under the roof. As the layer of mold thickens, it absorbs more heat. Another problem with mold is that it feeds on the limestone filler in the aggregate, breaking it down and shortening the lifespan of the roof. Power-washing or pressure-washing has long been the go-to method for cleaning hard-surface roofs like tile or slate. Typically, this is done with a wand or a round surface-cleaner. It’s not a job for the faint of heart and is usually best done by professionals who have experience walking on roofs and who use commercial-grade equipment. Tile and slate roofs cleaned by pressure-washing will stay clean for 6-12 months before the mold grows back and needs to be removed again. Note: asphalt shingle roofs should not be pressure-washed. In fact, roof warranties are usually void if an asphalt shingle roof has been power washed because this method of cleaning removes the aggregate. Over the last few decades, chemical-cleaning of roofs has become increasingly popular. In fact, most asphalt shingle roof manufacturers now endorse chemical cleaning as the only approved method for removing mold. Chemical cleaning companies use a solution comprising water, bleach, a surfactant, and fragrance. They apply this to roof surfaces and allow it to soak in and kill the mold. The solution and mold particles are rinsed off with a gentle water stream (pressure no greater than water that comes out of the average garden hose). If the mold layer is thick, repeat chemical applications are sometimes needed. Roofs that are chemically cleaned stay mold-free two or three times longer than roofs that are cleaned with pressure washing. Pressure-washing is generally less expensive; chemical cleaning lasts longer. We’ve talked about what makes for a healthy roof and about how to clean a roof. What about a roof that needs repairs? There are many different reasons why a roof needs repairing. Sometimes roofs get struck by hard, flying or falling objects like golf balls or tree branches. Clay or slate tiles will crack or shatter. Windstorms, hurricanes, and tornadoes can rip off single shingles or whole sections of asphalt shingle or cedar shake roofs. Hail can pulverize the aggregate on an asphalt shingle roof. These are all types of damage that require repair. A roof that has been improperly installed or has a vulnerable area can develop a leak over time. Moisture from a leaking roof can wreak havoc inside a home or building, rotting out supporting timbers and damaging stucco. Be sure to find a reputable roofing company to carry out your roof repairs. There are different ways to find a good company. Talk to your neighbors or local friends and get their suggestions for roofers. Someone who has already hired a roofing company and is pleased with their work, customer care, and price is a great resource. Look at a site that vets and scores service providers, like Angie’s List. Run a Google search for local roofing contractors. Read their Google reviews. Visit their websites to get a feel for their companies, how they are run, how long they’ve been in business, what warranties or guarantees they offer, and the quality of their customer service. Come up with a short list of roofing contractors and then call each of them. Describe the situation with your roof and ask them to send someone out to give you an estimate. Don’t accept an estimate over the phone. Get at least three companies to come out for an estimate. On the day of the estimate, keep notes that you can refer to later. Did the estimator arrive on time? Did he or she come in a marked company truck? Did he or she wear a company shirt or uniform? Were you shown proof of insurance and licensing? Did the estimator listen to your concerns? Did he or she access the roof and actually look at the damaged area? After the estimate, pay attention to the time it takes to get a callback or email with a written quote. Also note what sort of process is outlined for going forward. You’re doing this not just for the information on the job but also to get a feel for the professionalism and competency of the company. Once you’ve done all these things, you should be able to select a company that will carry out your roof repairs conscientiously, expertly, and professionally. Replacing a roof is a project and an expense, there’s no doubt about that. But with some information, it doesn’t have to be as big of a deal as it first seems. Everyone wants to know how much a replacement roof will cost. That depends on a number of factors. Cost factors include the material you choose for your roof and how much of the roof must be replaced. If the decking under the roofing material also needs to be replaced, that will add to the cost. Roofing choices for residential roofs usually include asphalt shingle, clay tile, slate, cedar shake, and metal. The least expensive material is asphalt shingle. The longest-lasting materials are tile and slate. There are additional roofing material options for commercial roofs. EPDM is a kind of rubber material. It stands for ethylene propylene diene monomer. It can be adhered to roof decking or fastened mechanically. BUR roofing is highly durable. It is made up of layers of felt and asphalt or bitumen. The felt is soaked in bitumen, bound with asphalt, and installed in cross-woven layers. BUR roofing is long-lasting but susceptible to infrared and ultraviolet rays, which leach oils out of the BUR over time. This material is a silicone coating applied to different kinds of roofing materials to extend their lives. It resists weathering, oxidation, harmful rays from the sun, mildew, and dirt. TPO stands for thermoplastic polyolefin. This membrane material is being increasingly chosen as a commercial roofing material due to its energy efficiency and its superior reflective properties. It holds up well in areas with year-round strong sun exposure. As the name indicates, this kind of material is installed with the use of heat from a torch. Most often a commercial roofing choice, it can also be used for residential roofs. Liquid Rubber roofing is installed in one continuous, semi-fluid layer that flows across a roof and surrounds all projections such as vent pipes, HVAC equipment, antennas, etc. It has superior waterproofing capabilities. It does not dry out or become brittle and is a budget-friendly roofing material. Metal roof coating helps a roof reflect the sun’s rays instead of absorbing them. A building’s cooling costs are lowered by as much as 50% since the amount of heat entering a building from the roof is greatly reduced. This waterproof roofing material is lightweight, durable, and covers surfaces well. It typically lasts for five years before needing to be recoated. Another thing to consider well when your roof needs replacing is which company you should hire do the job. Obviously, you want the best one that can work within your budget parameters. The process for finding and vetting a roofing company to replace your roof is the same process that you would go through to find one to make roofing repairs. See the section earlier in this article with our recommendations for how to find an excellent roofing company. If you’ve stuck with us to the end of this article, you deserve another cup of coffee or glass of iced tea! And, you now have the information you need to make sure you have a clean, healthy, and whole roof. We’ve educated you on the types of roofing materials available and we have recommended ways to go about securing the services of the best roofing companies. Thanks for reading, and good luck!